To Merge Custom Fields, select the fields you want to merge by clicking the box next to the field. Then click the “Merge Fields” button. 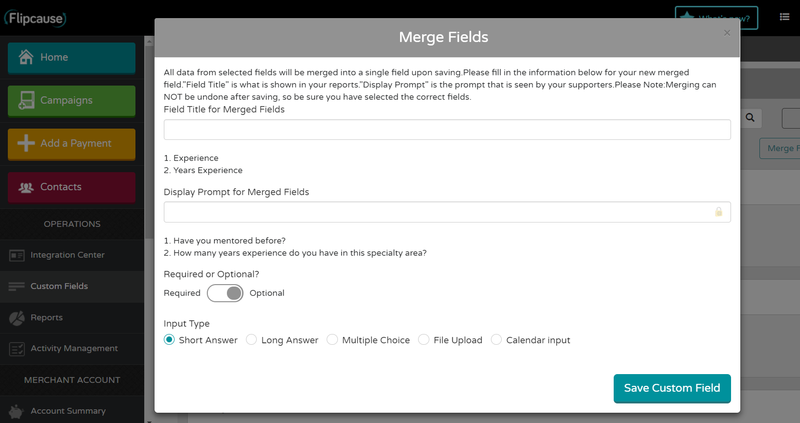 Enter a Field Title and Display Prompt for the merged fields. The Field Title is how it will appear in your reporting, and the Display Prompt is how it will appear to your supporters during the transaction. You can also make the field required or optional. Short Answer and Long Answer will present your supporters with a text box where they can type in a response. If you require a file to be uploaded such as a permission form or a waiver, you can use the File Upload input type to collect that. Then click “Save Custom Field”. Please Note: Merging cannot be undone after saving, so make sure that you have selected the correct fields and that you absolutely wish to merge these fields.